We hope you saved your pennies for this holiday season. With the United States' Black Friday (November 26) a little less than a month away, the folks behind Record Store Day have begun lining up releases that will arrive in independent record stores on that day. We've already learned about a new U2 EP, and now the Black Keys have unveiled plans to release their recent Brothers record as a limited-edition box set. 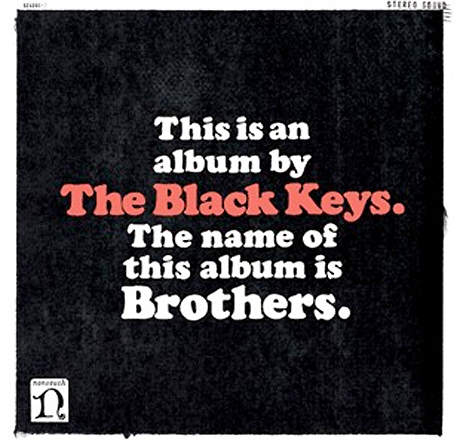 The Black Keys' label, Nonesuch, has revealed that the box will contain the album on double 45 RPM vinyl, as well as CD, plus a poster and a bonus ten-inch record. The ten-inch will contain six previously unreleased live recordings (see the tracklist below). Each copy of the box set will be numbered. In other Black Keys news, Pitchfork points out that the Black Keys are currently holding a look-alike contest over at their official website. If you win, you will get an autographed guitar, plus $100 worth of Black Keys merch. Two runners-up will get $50 worth of merch. Even better, the band promise, "We will use the photos in something HUGE. And amazing. At the end." If that sounds like something you'd be interested in, pick up a Black Keys Dress Up Kit and send in your photos before November 5. 6. "Too Afraid to Love You"